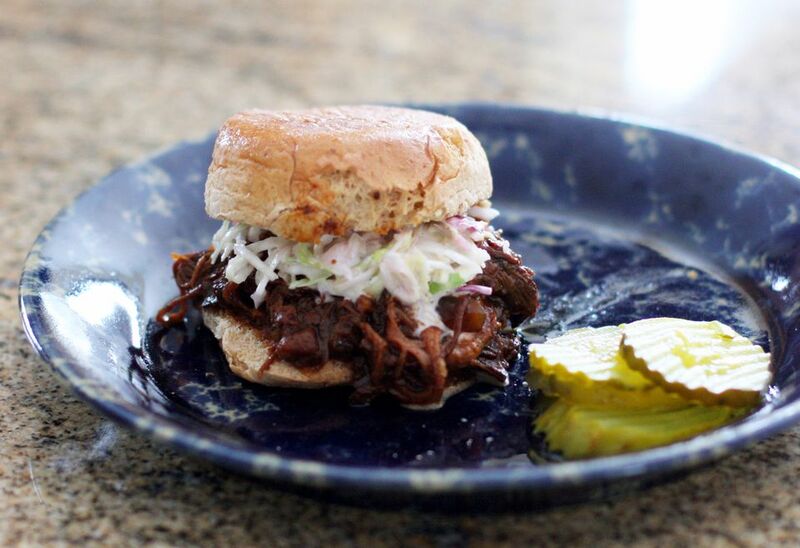 These easy barbecue beef sandwiches are made with a tender chuck roast slow cooked to perfection. A combination of ketchup, mustard, vinegar, and brown sugar make a fabulous homemade barbecue sauce for the beef. If you're short on time or ingredients, use a commercial barbecue sauce. Pile the shredded beef onto toasted slider buns or full-size sandwich buns, and serve them with extra barbecue sauce. Place the beef roast in the crockery insert of the slow cooker. If the roast is quite large, cut it in half or into quarters. In a bowl, combine the ketchup, brown sugar, vinegar, mustard, Worcestershire sauce, liquid smoke, salt, pepper, and garlic powder. Stir to blend thoroughly then pour over the roast. Cover the pot, and cook on low for 8 to 10 hours. Remove the roast, and shred the beef, discarding excess fat. Return the beef to the slow cooker, and stir to coat well with the sauce. Spoon the shredded barbecue beef over toasted sandwich buns, and serve with your favorite barbecue sauce, if desired. Eliminate the sauce ingredients, and use 2 cups of purchased barbecue sauce. Reserve some sauce for serving. Add 1 sliced onion to the slow cooker before adding the roast.